The process of removing artist Sam Durant's "Scaffold" from the Minneapolis Sculpture Garden will begin at 2 p.m. Friday, to be followed by a burning ceremony at an as-of-yet undetermined date (the dismantling is expected to take four days or so). 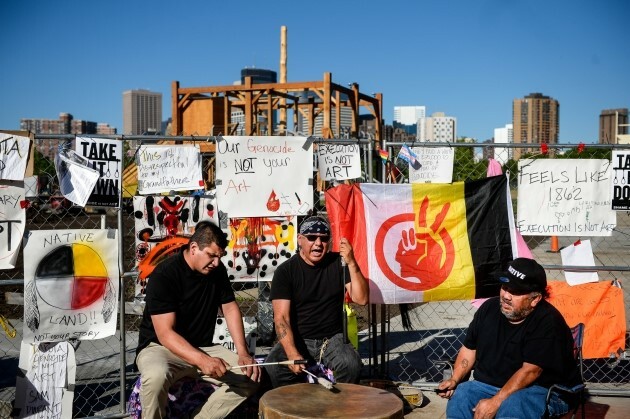 The decision was announced Wednesday at a press conference following a meeting between Dakota elders, Durant, Walker Art Center Executive Director Olga Viso, Minneapolis officials and mediator Stephanie Hope Smith, who specializes in sacred sites. "Scaffold" (2012), a viewing-platform-like structure made out of wood and metal, replicates gallows from seven state-sanctioned U.S. executions, including the 1862 executions of 38 Dakota men in Mankato, Minn. News of these gallows broke last Friday, when Viso posted a letter expressing remorse for the pain the sculpture might cause the Dakota people. Then came word that the sculpture would be taken down, followed by an announcement that the garden opening would be delayed a week to June 10. As people from different parts of the country watched on, I asked a few art critics across the nation to weigh in on the matter. I received six responses. I felt strongly about this, and actually emailed the Walker, saying I hoped they'd abide by the wishes of the Dakota people, whatever they turned out to be. I think Sam Durant’s response was exemplary, and the museum people involved did the right thing. People talk about the “rights” of artists to address all things, but the gallows piece made me keep thinking of an analogy … what if a gentile artist in post-World War II New York decided to create an installation recreating the showers at Dachau at MOMA? There would have been absolute outrage … people don’t want to be reminded of their own or their ancestors' victimage, which itself carries shame — particularly by an outsider, and within a community that isn’t their own. Any “empathy” or “education” in response to the Holocaust by non-Jews would have been, and still would be, enormously resented. Why is this response considered reasonable in this case, but not in others? We talk a lot about how art should create space for “difficult conversations” — but too often the dialogue is one-sided, with the artist doing all the talking in the name of free speech and others left only with the option of protest and complaint. The controversy around "Scaffold" is one of the few times I’ve seen these difficult conversations actually come to pass in a useful, thoughtful, and productive way — and it happened because Sam Durant and the Walker were able to recognize that listening is an essential part of speaking freely. This is how discourse should work. If we're smart, we'll come to see this process — the construction of the piece, the protests, the mediation, as well as the ceremonial destruction — as one of the most important social practice art works of our time. I think the Sam Durant scaffold piece may be remembered as one of the most important works ever commissioned by the Walker Art Center. The artist has built a flexible art practice that allows him to engage in this kind of dialogue and, unlike the Dana Schutz painting controversy earlier this year at New York’s Whitney Museum, Durant has that flexibility incorporated into his artistic practice. Ultimately his idea is the work. This is particularly interesting because in Western culture we’ve built up this stereotype of the white male artist as unquestioned genius, but here we have someone who is open to a local community and has decided (I'm going to assume no one is making him do this) his ego isn't central to the conversation. We have to move away from this idea that the art object ever existed in a vacuum. It doesn't. It interacts with established systems of power, and I know Durant knows that, as his art has been deconstructing these networks of power forever. I think he's helping others realize there are new ways of addressing these controversies and issues. I hope the Native American community feels at peace with this decision. The situation surrounding "Scaffold" was created by a white artist and largely white institution failing to realize the privilege of their own situations. So it's with hesitance that I respond to a request for comment as a white art critic. I haven't seen "Scaffold" in person, but more important, it touches on a number of histories about which I don’t know enough. Rather than offer my own take, I’d prefer to hear what a Dakota art critic thinks of the work. And a Black art critic. And a Latina art critic. And an Asian art critic. As long as our field continues to be predominantly white, we'll never have the most honest and rigorous conversations about art that we could and should be having. Standing with my feet on the planks of “Scaffold,” my perspective raised above the crowd at Documenta five years ago, I had a profound experience of reckoning. With every step down off of it I experienced my privilege in a bodily way. Sam Durant had drawn a straight line between the unresolved and ongoing history of racism and genocide in the U.S. and the worst atrocities in human history within the context of that exhibit, founded in the wake of World War II. On U.S. soil, and especially in Minnesota, the meaning of “Scaffold” shifts, though. It has served as a cautionary reminder. White Americans bear a responsibility to dismantle white supremacy, but we are also, so often, interlopers in need of schooling and humility. Let it burn. In general it’s time for all us to shut up and listen. The work wasn’t that good in Documenta either. The real problem with it is that ALL its supposed content is in the work’s explanatory wall label. The work itself is meh-sensationalism. Male fixation on big death.